— Preheat oven to 180 ˚C (350 ˚F). — Slice the eggplants in two, lengthwise; hollow them out and set the flesh aside. 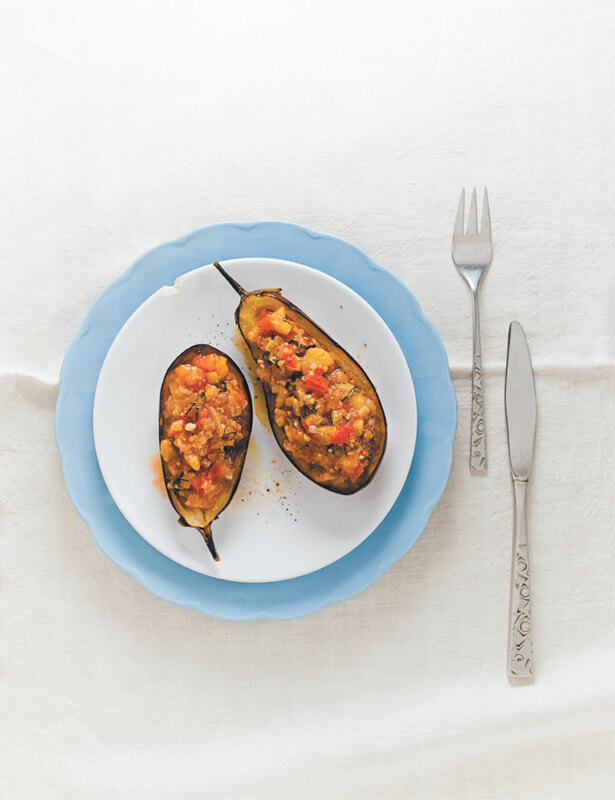 — In a large skillet, heat olive oil and brown the eggplants on both sides. Remove and place in a baking dish. — In the same skillet, combine garlic, onion and eggplant flesh, and cook 2 to 3 minutes on medium heat. Add mint and tomatoes and cook for few minutes. Season to taste, add chicken broth and reduce liquid to half. — Stuff the eggplants with the mixture and bake on the centre rack of the oven for 45 minutes. TRICK — Eggplants are at their best when served at room temperature. For lunch, serve with feta cheese, a green salad and good crusty bread. — These eggplants are also perfect with any grilled`meat, fish or a leg of lamb, or as a garnish to any pasta with fresh grated Parmesan cheese. NOTE — To all men, here is food for thought… Nicomou seduced me with the flavor and simplicity of this recipe.